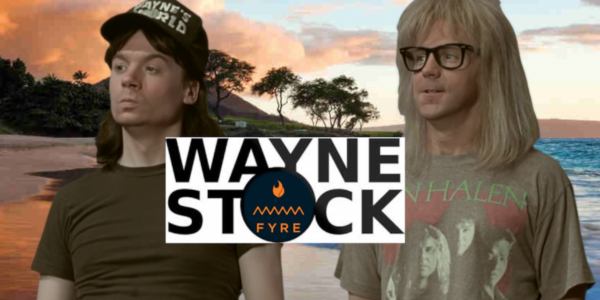 In 1992 Rock and roll fans Wayne Campbell and Garth Algar were host of their public-access television show, Wayne’s World, from an abandoned factory in Aurora, Illinois. After an Aerosmith concert, Wayne has a dream in which he meets Jim Morrison and a “weird naked Indian” in a desert. Morrison convinces Wayne that his destiny is to organize a major music festival. Wayne and Garth dub the concert “Waynestock” and hire Morrison’s former roadie, Del Preston. Their early attempts to sign bands and sell tickets fail, and Wayne wonders if the endeavor is futile. The Fyre Festival was a music festival scheduled to take place on the Bahamian island of Great Exuma over two weekends in April and May 2017. Organized by Fyre Media founder Billy McFarland and rapper Ja Rule as a luxury music festival to promote the Fyre music booking app, the event was promoted on Instagram by “social media influencers” including socialite and model Kendall Jenner, model Bella Hadid, model and actress Emily Ratajkowski, and other media personalities, many of whom did not initially disclose they had been paid to do so. During the Fyre Festival’s inaugural weekend, the event experienced problems related to security, food, accommodations and artist relations. Eventually, the festival was indefinitely postponed after some attendees had arrived, finding tents and prepackaged sandwiches, instead of the luxury villas and gourmet meals they had been promised when they paid thousands of dollars for admission. A recent Netflix Documentary has brought Billy McFarland’s scam to light. This is what would have happened if Billy was running WayneStock.